Repackaged for the European market, these two live DVD/CD combo sets have been previously available through Rundgren's online store and the usual major internet retailers as four separate items; two DVD's and two stand alone CD versions of the same sets. 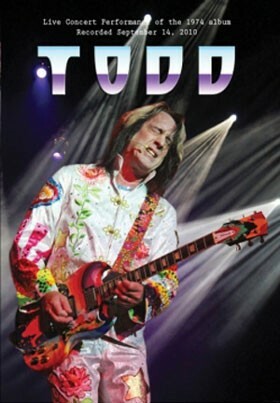 In recent years Todd has taken to playing some of his most influential albums in their entirety, following up his 2010 'A Wizard/A True Star' concerts with a few more in the same year showcasing his equally eclectic and experimental 'Todd' double LP from 1974, and after a short interval, the whole of the rhythmic and atmospheric 'Healing' record from 1981. The band for these shows will be instantly familiar to Rundgrenites, all of them having played with him frequently in the last thirty-odd years, including Utopia/Meatloaf bassist Kasim Sulton, drummer Prairie Prince of The Tubes, long-time guitar partner Jesse Gress, keyboard player/saxophonist Bobby Strickland and fellow keyboard player Greg Hawkes of The Cars. With Rundgren also providing occasional (but not often enough!) lead guitar and piano, and with the occasional input of a choir under the direction of choirmaster Dirk Hillyer, the many different permutations are used to stunning effect. Taking 'Todd' first, the groundbreaking mixture of styles hasn't diluted one bit and the band seem to have great fun recreating the layers of sound on the psychedelic 'I Think You Know', the rather silly 'An Elpee's Worth Of Toons' and the mesmerising synth-led instrumental 'The Spark Of Life', all tricky pieces delivered with smiles, grand costumes and no small amount of musical skill. There are great examples of Todd's supreme balladry in the beautiful 'A Dream Goes On Forever', the soulful 'The Last Ride' and the simply awesome 'Don't You Ever Learn', whilst there's also heavier fare in the busy 'Everybody's Gone To Heaven/King Kong Reggae', the Zappa/Hendrix-inspired 'Number One Lowest Common Denomenator' and the frantic 'Heavy Metal Kids'. Todd's poppier side is irresistible on 'Izzat Love?' and 'Useless Begging', the Gilbert and Sullivan operetta 'The Lord Chancellor's Nightmare Song' is as chaotic as expected, and the gospel-tinged anthem 'Sons Of 1984' makes the most use of the choir, the crowd keeping the chorus going into the interval long after the band have faded out and the curtain has closed. At some of the many Todd Rundgren concerts I've attended he can sometimes improvise a little too much and veer away from the melodies you know and love, but here he sings very well indeed and some of the versions are very close to the perfection of the original records, which is probably why they left out the jerky, overlong instrumental 'In And Out The Chakras We Go', which is no great loss. 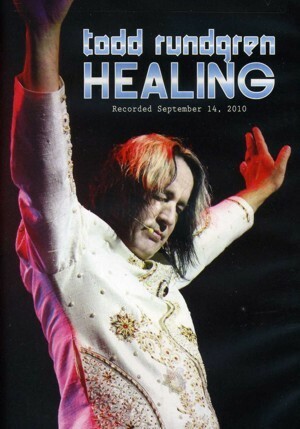 With even sillier costumes worn by the man and his band, 'Healing' is a completely different proposition, with various band members taking their turns on the many layers of synths and Rundgren singing the obtuse lyrics whilst pacing from one side of the stage to the other. He hardly plays any guitar or keys on this one, favouring a sparser and more rhythmic atmospheric style that certainly owes just as much to world music as it does to rock. 'Healing', I guess, is an album you really need to know to appreciate, especially the twenty minute title track in three movements, with the band having their work cut out to recreate the harsh, angular and sometimes downbeat moods. Sulton's great singing voice helps out greatly on the multiple parts of 'Pulse', 'Flesh' and the light-hearted 'Golden Goose', and Rundgren gives some of his best ever vocals on the brilliant 'Healer' and the beautiful 'Compassion', but goes a little too over the top on the frantic crescendo of 'Shine'. The obliqueness of some of the material is tempered by the inclusion of the two tracks from the single that was free with the original LP, with the stirring atmospherics of 'Tiny Demons' and the commercial pop hit 'Time Heals' appearing at the end of the sides of the LP. Rather bizarrely 'Healing' again ends with the last track from 'Todd', not replayed but exactly the same footage of 'Sons Of 1984' that ended the other DVD. If you're a Todd fan then both of these releases are essential. They're well shot in the small but attractive Keswick Theater in Philadelphia, and the audio is excellent, however, I have a couple of gripes. Firstly, the performances of both these albums runs at around an hour each, so would have easily fitted on one DVD, the only extra on each is an interview. Secondly, and even more confusingly, the copies I've been sent were both US region 1, which means I can play them on my computer but not on my DVD player. It's especially annoying as both discs clearly proclaim that they were 'Made in the EEC', so I can't really tell you if all of them are like this or just the copies sent to the press. But that apart there's two great performances of two great and very different milestones in Rundgren's career.